As you go about your annual spring cleaning rituals, take a few additional steps to save money on energy bills, improve your home’s appearance and ward off big-ticket repairs later. Here are 10 tips for you to help prepare your home for warmer months and keep it in top shape.. Inspect the AC: For about $75 to $200, a technician will tune up your cooling system and make sure you don’t spend the first hot weekend of the year with an out-of-commission air conditioner. Dirty filters make your air conditioner work harder, increasing energy costs and possibly damaging your equipment. Check them monthly and replace them as needed! Repair Your Roof: An easy way to inspect the roof to find damage is to use a pair of binoculars. If need be, hire a handyman or a roofer to repair any missing shingles or other damages. Make sure to clean out roof drains to avoid damaging the roof and causing leaks. Pressure Wash Your Home: Clean your home’s exterior to remove accumulated dirt, mold and stains from the siding, deck, sidewalks, driveway, garage floor, fences, and lawn furniture. You can rent a pressure washer or hire someone to help. Prepare To Mow: A dull lawn mower blade doesn’t slice, but instead tears grass leaving it vulnerable to disease, sun damage, and insects. A blade typically needs sharpening once or twice a year, or more often depending on how big your yard is. Lose The Lint: Make sure to clean your clothes dryer’s lint trap before every use. A clogged vent can reduce your dryer’s efficiency and create a fire hazard. Put The Temperature on Autopilot: For an initial investment of $50 to $150 dollars for a programmable thermostat, you can save about $180 annually on cooling and heating bills. Set the hold feature for a constant, efficient temperature when you’re away for the weekend or on vacation. Caulk The Cracks: If the gap around a door or a window is wider than a nickel, you need to reapply exterior caulk. Add weatherstripping around doors, making sure that you cant see any daylight from the inside of your home. For more tips to prepare your home for spring click here. 1. Enhance your curb appeal: This is the first impression potential buyers will have of your home, so it better be a good one, or else they might just drive on by. As the snow melts and the grass starts to turn a beautiful green color, make sure you’re ready to take advantage of the weather. 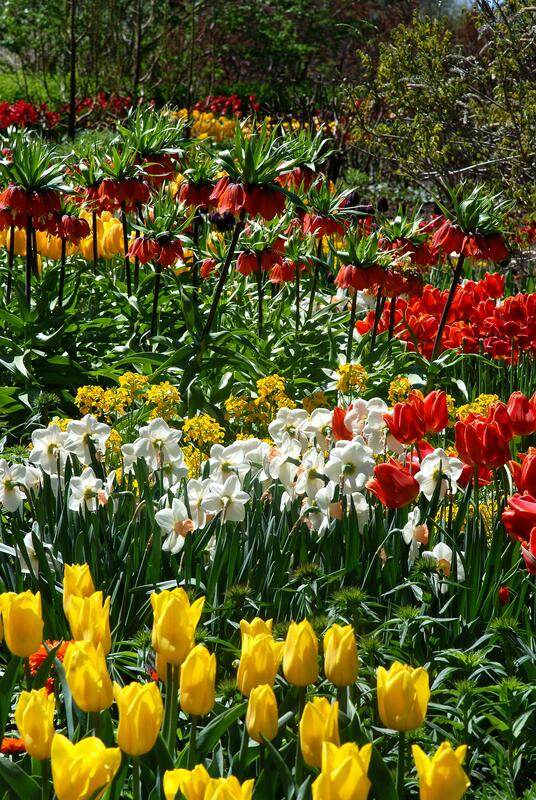 Spring is the prime planting and growing season for many flowers in New Jersey, so check out your local nursery for plants that will make your home look vibrant, bright, and friendly. Mow the lawn (if necessary), and also be sure to clear away any wet piles of leaves or dead tree branches that may be lingering in your yard. If it’s still too cold out to plant flowers, you need to make sure, at the very least, that your driveway and walkways are cleared of snow. 2. Leave no evidence of children or pets. Your home should be completely uncluttered (no children’s toys) and it should smell like spring (no litter boxes or dog droppings in the yard). Arrange for a friend or family member to watch your pets and/or kids when you’re having a showing in order to make sure that the buyer is not distracted and not put off by clutter or pet smells. 3. Make your home sparkle and shine. This means you need to take your spring cleaning to the next level. Do this by focusing especially on windows, mirrors, glass fixtures, etc. The goal is to let as much light in as possible and make your home seem as bright (and inviting) as possible. Change out thick, dark curtains for light, sheer ones, and consider installing lights under cabinets and adding extra fixtures/lamps in naturally dark corners of your home. 4. Spring cleaning! Most people practice this ritual even if they aren’t planning on selling their home, so this is a great way to take advantage of the season to help you sell your home. If you’re already a meticulous cleaner, great, if not, make sure that you don’t skip or slack off in any areas of your home when cleaning. Be particularly thorough when cleaning your bathrooms and kitchen, because those are the deal makers or breakers of any home. Don’t forget to dust and clean all floors as well! 5. Market your home for sale. Your real estate agent will be able to help you with this part of the process, but you should put some thought into it as well. Writers from Ziprealty recommend that if your home sat on the market all winter to remove your listing and post it again fresh. You should also create brochures for your home, market online and in print. For more information on how to sell your home this Spring visit this website. always preach safety first, but we don’t always practice what we preach. Home Tips recently wrote an article passing along some tips for those of you tackling home improvement projects this Spring. Accidents can happen. You need to be especially careful when you are working at heights; with power tools or sharp blades; with heavy, awkward, or toxic materials; or with electricity and natural gas. It isn’t worth it to do your own home improvements if you run a high risk of injuring yourself. 1. Tackle only those tasks that you feel safe handling. 2. Keep a tidy work area. Keeping a tidy work area helps you to avoid creating your own hazards. Don’t allow power cords to tangle. Pick up and properly store power tools, sharp tools. or dangerous materials that might cause injury. Pull all nails from old lumber. 3. Keep tools and supplies away from the reach of small children. 4. Dress for safety. Don’t work in flip-flops and shorts. Sturdy clothing, work boots, and gloves will protect you. Wear safety glasses when you use power tools, hammers, or other striking or cutting tools. If you are going to be working beneath construction, get a hard hat. 5. When using a ladder, position it on a flat, firm surface. As you climb or reach, keep your weight centered. Do not lean on one side, keep your hips between the rails and never stand on the top two rungs. When using the extension ladder to reach the roof, extend at least two rungs about the eaves this way you can hold on to the ladder as you step onto the roof. 6. Don’t go up on the roof in bad weather. 7. Equip your garage or workshop and your home with fire extinguishers. Every home should have two working fire extinguishers. Be sure they are large enough to handle home fires; they need to be rated a minimum size of “2A10BC” on the label. Periodically check them to make sure they are fully charged. 8. Protect yourself against exposure to hazardous chemicals and materials. Many varnishes, solvents, preservatives, adhesives, and other products used to accomplish projects contain hazardous ingredients. Pay attention to all label warnings, including instructions about proper ventilation. 9. Dust and fibers can be hazardous to breathe. When sanding wood, wear a dust mask. Never sand, scrape, or dislodge surfaces that you suspect contain asbestos; doing so can put highly hazardous fibers into the air. 10. Always keep a good first-aid kit on hand. For more information and safety tips read the original article here. Old Mill Estates Open House Sunday 2/10!! The Magnolia & Sequoia Spec homes are nearing completion in Old Mill Estates! Come out this Sunday February 10th to our open house from 1 to 4pm! Marble Arch Homes proudly presents Old Mill Estates which is located in prestigious Marlboro Township in desirable Monmouth County. There are only 8 exquisite estate homes set on half acre lots. Magnificent exteriors feature full brick or stucco, designer windows and 2 car garages. Luxury is the byword here. The models and alternate elevations feature majestic rooms and all the stunning details that come along with a stately residence: impressive 2 story foyers, formal living and dining rooms, impressive kitchens featuring center islands , fine cabinetry and sumptuous baths featuring Kohler/Sterling fixtures. All the homes have full waterproofed concrete basements. Every convenience is here from city water and sewer to great shopping centers, restaurants, cinemas and an easy commute to New York City via public transit. Looking to send your kids to camp this summer? Summer Camp Registration will be on-line beginning February 15th! Preview and set up your account beginning February 1st by clicking here. Look for our new before and/or after care programs for all age groups! Marlboro Township’s Recreation Summer Day Camp is a six-week program, open Monday through Friday, approximately 9:00AM to 3:00PM. Our program is located primarily in the Board of Education Schools throughout the township. The Day Camp serves children currently in grades K-6, with each school servicing one grade level. For safety consideration, each school has a maximum enrollment capacity. For children that are currently in 7th or 8th grade, Marlboro Recreation offers Travel Camps. Campers will spend five weeks visiting some of the Tri-State Area’s most exciting attractions. Campers will be transported via coach buses to enjoy summertime fun. They will spend their days at water and amusement parks, taking in sporting events, visiting some of Jersey’s beautiful beaches and so much more! Bring your talent and creativity to the stage. Join our summer camp that offers the chance to experience every aspect of theater. Whether you can sing and dance, act or want to be behind the scenes doing lighting, sound and set design, you can do a little bit of everything. Each of the two sessions will produce a unique production and art display for friends and family. Add a seventh week to your child’s camp program. Held exclusively at the Aquatic Center. Participants will spend a fun filled week swimming, playing games and sports, arts, and crafts and more! Campers will go on two half day trips! New for 2013: Before & After Camp! This program is to be held solely at the recreation center. Parents are responsible to get children to the recreation center. Transportation included to bring children from Rec Center to respective camp locations. Grades K-6. Children will be bussed back to the recreation center at the end of the camp day. Grades K-8 eligible. Snack will be included. Click here for registration forms & more information!